Happy Sunday!!! What are YOU having for breakfast? 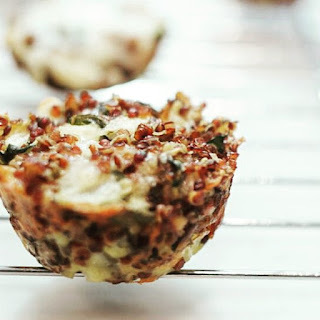 We are giving these Quinoa pizza bites, a delish 21 Day Fix recipe a try! These are great for kids or adults for breakfast, lunch or a mid-day snack! Great little brunch recipe too! Easy to make, bite size and family friendly! What more could you want? I make a LOT at once to keep handy. Below is about 1 serving so modify it to make more and play with it according to how much cheese, quinoa, etc you want in them. And don't be afraid to add veggies too! 2. Mix all ingredients together except the pizza sauce. Spray a mini muffin pan with olive oil or coconut oil spray. These look great but I'm confused by the portion size. One portion can't include 1 cup of quinoa. I'm assuming this is two servings at the least?